Learn all about the world-famous San Diego Zoo. The first San Diego Zoo fact you should be aware of is that it a San Diego institution -- in fact, it is world-famous. Founded over 90 years ago, the zoo is a beloved tourist attraction and has a worldwide reputation in the field of wildlife and animal care. What Makes the San Diego Zoo Different From Other Zoos? The San Diego Zoo sets the standard for modern zoos -- its innovative animal habitats provide natural settings for animals, often with different species living among one another. The 100-acre facility features lush landscaping and foliage, and the canyons and mesas make the experience unique for visitors. 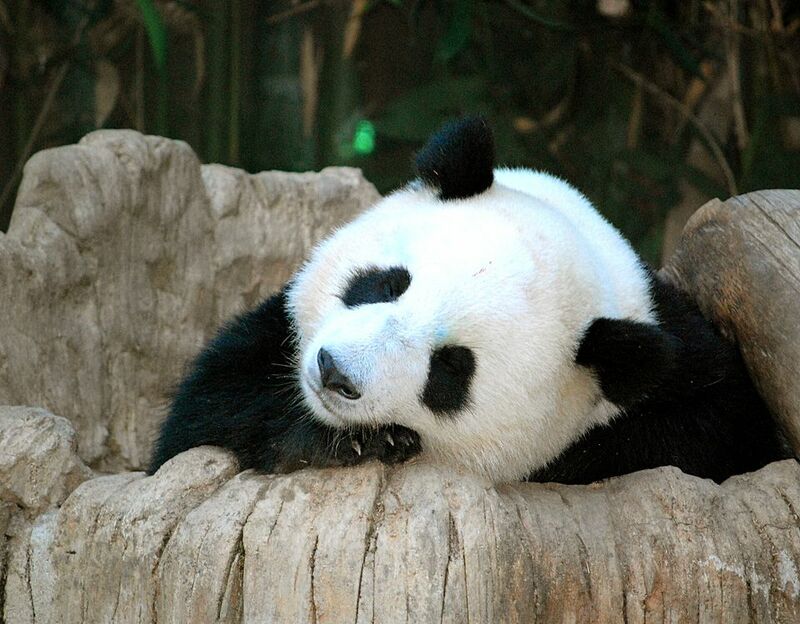 The Zoo has the largest population of the critically endangered giant pandas in North America. It is estimated there are only about 1,600 giant pandas in the world so it is a special opportunity to be able to see them at the San Diego Zoo. What Other Animals Can You See? Elephant Odyssey provides a spacious home for elephants, as well as other animals like California condors. Monkey Trails is a multi-level habitat featuring monkeys from Asia and Africa, plus other species. Tiger River and Polar Bear Plunge showcase these popular animals. And there's usually fun antics at Absolutely Apes, where the orangutan residents are hanging out. Take a ride on Skyfari, the aerial tram. This gives you an amazing and dizzying view of the zoo grounds. The Guided Bus tour is a good way to acquaint yourself with what the San Diego Zoo offers. The Children's Zoo is a great way to get kids up close to the animals. The various animal shows are both entertaining and educational. The San Diego Zoo’s collection was created from a scattering of specimens that remained in Balboa Park at the close of the 1915-1916 Panama-California International Exposition. The not-for-profit Zoological Society of San Diego was incorporated on October 2, 1916, by a local surgeon, Dr. Harry M. Wegeforth, and friends. The Zoo has been in its present location in Balboa Park since 1922. The 100-acre San Diego Zoo has undergone massive changes since its inception in 1916, introducing innovative designs and exhibits that feature 4,000 animals representing 800 species. If you've grown up in San Diego, or if you have kids, the San Diego Zoo is one of those places that you likely cherish. It truly is one of San Diego's most beloved places and at 90-years-old and counting, holds memories of countless generations. As a born-and-raised San Diegan, going to the Zoo as a child was always a special event. As an adult, I appreciate the mission of the Zoological Society and appreciate the changes made to benefit the animal residents. If you visit the San Diego Zoo, a full day is the best way to do it justice. It's a large facility, with lots of inclines, canyons, and mesas, so be prepared to do a bit of walking, but that's the best way to experience the zoo. In the summer, evening hours of Nighttime Zoo let you experience the San Diego Zoo in a different light. The orangutans and siamangs of Absolutely Apes always put on a show, as do the gorillas at Gorilla Tropics. The underwater views of the hippos at Ituri Forest let you watch their underwater ballet. Also, spend lots of time at the Monkey Trails habitat...it's worth a whole afternoon. The San Diego Zoo website also offers podcasts to download and tailor your own self-guided tour on your iPod. The San Diego Zoo is located north of downtown San Diego in Balboa Park and is open every day of the year. Best Value Admission (which includes a Guided Bus Tour, Kangaroo Express Bus, and Skyfari aerial tram and all regularly scheduled shows) is $50 for adults, and $40 for children ages 3 to 11. (Ticket prices are subject to change.) The San Diego Zoo also has a number of special tours you can partake in, such as sunrise and nighttime tours.